EDITOR’S NOTE: This is an updated version of a post I wrote in 2009, shortly after I had my first of many phone calls with writer Robert F. Dorr. In the years between then and Bob’s death in June 2016, I talked with him fairly often. He became a long distance friend and mentor who encouraged and helped support my efforts to publish the Men’s Adventure Library book series. In 2015, I had the honor of collaborating with Bob on the book A HANDFUL OF HELL, a collection of his classic men’s adventure magazine war and adventure stories. Over the years, I wrote quite few posts about Bob, his stories and books for this blog. Now that he’s gone, I’m updating and reposting them for the benefit of his old and new fans who may have missed them. It’s also therapeutic for me. I miss Bob. He was one of a kind. 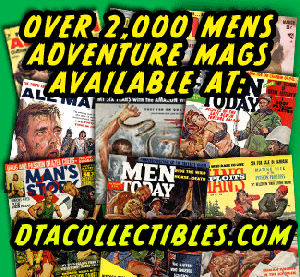 From the late 1940s to the mid-1970s, men’s adventure magazines published stories by many writers who later became famous novelists, such as Mario Puzo, Bruce Jay Friedman, Lawrence Block, Robert Silberberg, Harlan Ellison, Walter Wager, Donald Westlake and Martin Cruz-Smith. 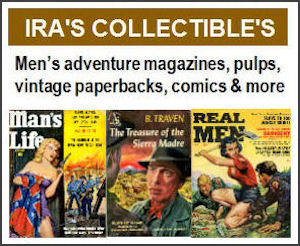 One writer who regularly penned stories for men’s adventure magazines went on to become famous for his non-fiction books: Robert F. Dorr. Bob is now best known as one of our country’s top military aviation historians. He’s the author of nearly 80 history books and a regular contributor of articles and columns to history and military magazines. Relatively few of Bob Dorr’s current fans know that he learned and honed his skills as a writer by writing stories for men’s adventure magazines in the 1960s and 1970s. 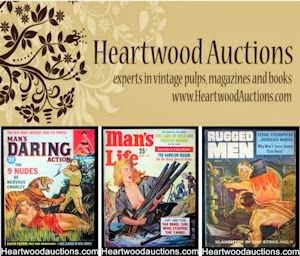 In fact, he wrote hundreds of them for a long list of men’s adventure magazines, including ACTION FOR MEN, BLUEBOOK, ESCAPE TO ADVENTURE, FOR MEN ONLY, MAN TO MAN, MALE, MAN’S MAGAZINE, REAL and STAG. Most of them are war stories. Some are clearly direct forerunners of his history books. His latest book is HELL HAWKS! THE UNTOLD STORY OF THE AMERICAN FLIERS WHO SAVAGED HITLER’S WEHRMACHT — which he co-wrote with former U.S. astronaut Thomas D. Jones. Last week, I had the pleasure of talking with Bob Dorr by phone. 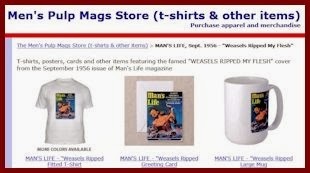 He had stumbled on this blog and sent me an email saying that he used to write stories for men’s adventure magazines. I wrote back asking if I could talk to him about those days to learn more. Now that’s I’ve hooked up with Bob, I plan to do a number of posts about him, his men’s adventure magazine stories and his books. I’ll start with a look at his Korean War story “Charge of the Mad Machine Gunner,” the featured cover story from the January 1967 issue of MAN’S MAGAZINE. It’s a gripping story about an American soldier who became a hero during a bloody fight with North Koreans troops near Seoul in 1950. The illustration used for it on the cover and two-page interior spread was done by artist Mel Crair. Crair was a versatile artist who created thousands of top-notch illustrations for men’s adventure magazines, other magazine genres and paperback books. Dozens of his men’s adventure magazine paintings were done for stories written by Bob Dorr. Like almost every story Bob wrote, “Charge of the Mad Machine Gunner” includes so many realistic details that I couldn’t tell if it was true or not, especially since some of the war stories he wrote for men’s adventure mags were based on real people and events. 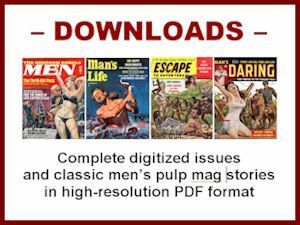 The task of separating fact and fiction is especially complicated in men’s adventure magazines, since the editors wanted readers to believe most stories were true. To create this illusion, they often illustrated stories with photographs that the captions said were photos of the characters, places and scenes involved. For example, on page three of “Charge of the Mad Machine Gunner” there’s a headshot photo that’s purported to be the central character in the story, Corporal Ray McIver. Another photo supposedly shows GIs in McIver’s squad pinned down by North Korean gunfire. But in the phone call I had with Bob, he told me “Charge of the Mad Machine Gunner” is a fiction yarn. He didn’t know who the man in the photo was. He did know it wasn’t Corporal MvIver, since Bob made him up. Bob’s writing is so vivid and convincing that I wouldn’t have been surprised if he’d told me “Charge of the Mad Machine Gunner” was true. And, as he explained, some of his other men’s adventure magazine stories actually were about real life war heroes. He later featured some of the same men in his history books and articles for history magazines. If you’re curious, you can read “Charge of the Mad Machine Gunner” for yourself. With Bob’s permission, I’ve made a free PDF copy available to readers of this blog. You can download it by clicking this link.